The Queensland section of the Savannah Way has plenty of hop-on, hop-off points, but this itinerary takes you from west to east, including must-do loops and detours along the way. You’ve driven over the Northern Territory border and into the gates of Hell; correction, into Hell’s Gate. The bloody history of this old, cattle droving landmark might not have the most welcoming name but the Hell’s Gate Roadhouse is a welcome stop as you arrive in outback Queensland. Take the opportunity to refuel, refresh and camp following the 306kms from Lorella Spings. The roadhouse offers cabins, powered and non-powered sites within walking distance from their fully-licensed bar. Moving onto the Burketown, you’ll quickly discover why it’s the Barramundi capital of Australia. Positioned on the Albert River and a short distance from the Gulf of Carpentaria, Burketown is a fisherman’s paradise. If you haven’t packed the rod and reel, stop in at the local general store to pick one up and chat to the locals for insider knowledge on the hot spots. With wetlands to the north and grasslands to the south, Burketown is a haven for Australian birdlife. Keep your binoculars steady and you might spot one of the 13 endemic, seed-eating birds that Australia’s tropical savannahs are home to. If you’re looking to tick a few finch off your list, this is your spot with 14 of Australia’s 18 species residing here. Learn the history of Traditional Owners on a memorable stargazing tour over the salt plains, north of Burketown with Yagurli Tours. Dreamtime stories of the Gandalidda People will be interpreted through the stars, in skies completely free from light pollution in this culturally significant place. Head off the beaten path to one of three World Heritage Areas in Tropical North Queensland, the Riversleigh Fossil Fields within the Boodjamulla National Park. The drive to Adel’s Grove from Burketown is partly unsealed and four-wheel drive is recommended. Adel’s Grove is an outback oasis and a great base to explore the Boodjamulla (Lawn Hill) National Park and Riversleigh Fossil Fields. Hire a canoe at Lawn Hill Gorge and explore the spectacular, green waters surrounded by breathtaking 60m high sandstone walls. Half-day tours of the national park and fossil fields are available from Adel’s Grove with qualified Savannah Guides. Jump on a pub-crawl & visit the Albion Hotel. When a replica statue of the largest croc ever shot competes with a purple pub as the most photographed thing in Normanton, you know you’re in a place with a lot of personality. The friendly characters who call this historic township home create a memorable experience; and, the best way to meet them is at one of the three quintessential outback pubs. Jump on a pub-crawl with a dusty twist and visit the Albion Hotel, the Purple Pub (National Hotel) and the Central Hotel. Normanton is also rich in exploration history with the last marked campsite of Australian explorers, Burke and Wills nearby. Various accommodation options are available in Normanton and the fishing rod you grabbed in Burketown can have another moment on the banks of the Norman River. Sunsets over the ocean aren’t very common throughout Queensland but Karumba on the Gulf of Carpentaria offers up one of the best. On your way, you’ll pass through the Mutton Hole Wetlands; if the birdwatcher could pick anywhere to stop, this internationally-listed wetland habitat would be the place. Here, you’ll likely spot brolgas, pelicans and black swans amongst the tidal estuaries that are also habitat to saltwater crocodiles. Karumba is the centre of Australia’s prawning, crabbing and barramundi fishing industries, so it’s no surprise that the busiest places in town are the boat ramp and the Sunset Tavern, both brimming with stories. To see what all the fuss is about, book a seat with Kerry D Fishing Charters and visit some of the best spots to wet a line. They’ll bring the gear, quality bait, tackle and your smoko too. 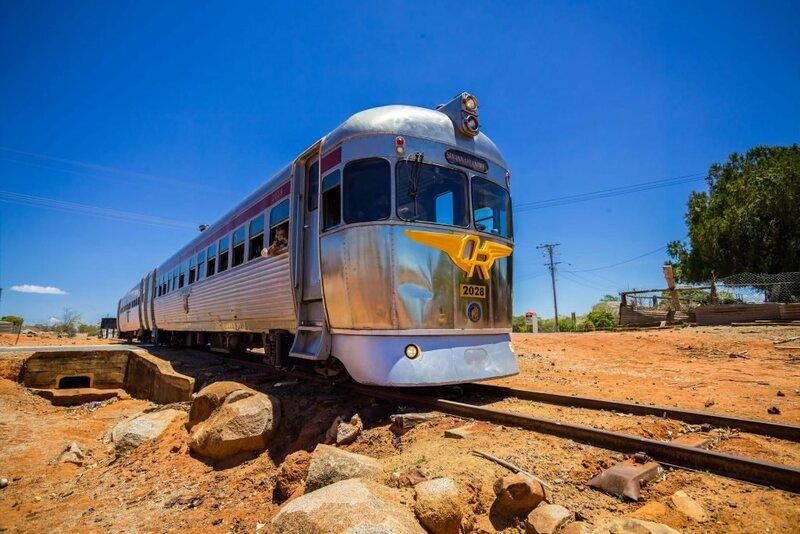 Ditch your wheels at Normanton and jump aboard the Gulflander, one of the last great rail journeys in the world, famously travelling from nowhere to nowhere. Departing for Croydon each Wednesday, the Tin Hare, as it’s affectionately known, passes through the heart of the Gulf Savannah on a line originally built to service the gold rush of Croydon in the late 1800s. The journey is rich in history and on-board Savannah Guides share stories and trivia of its colourful past. The Gulflander has a number of travel options available, including a one-way trip with a coach return to Normanton or a share ride, where someone travels half way by train before swapping with their driver who’s followed along by road. You can also opt to enjoy a return trip with a night’s stay in Croydon. Croydon is a historians’ heaven, rich in mining history following the discovery of gold in 1885. Croydon’s True Blue Visitor Information Centre is the hub of history and hosts collections of heritage items, photographs and information displays. Nearby, Lake Belmore provides a great environment for year-round fishing and while camping here is not permitted, day use is encouraged with picnic tables, BBQs and lots of shaded places to rest. Georgetown sees your arrival into the Etheridge Shire, best known for its fossicking sites and gem-laden landscapes. A gold mining hub in its heyday, Georgetown is still frequented by fossicking folk hunting for semi-precious stones like topaz, quartz, spinel, garnet, cairngorm, aquamarine and sapphires. If you don’t have the time or tools to dig, head to the TerrEstrial Centre in the heart of Georgetown to see the impressive Ted Elliot Mineral Collection. Showcasing approximately 4,500 specimens, the detailed collection is the culmination of a lifetime’s work by avid collector, Ted Elliot. The centre is also a Visitor Information Centre, Council Library and Internet Cafe, so stay a little while. A trip to the Etheridge Shire isn’t complete without a trip to the spectacular Cobbold Gorge. The intimate gorge carves its way through ancient sandstone cliffs revealing some of the most breathtaking landscapes formed hundreds of millions of years ago. Cobbold Gorge sits within a large nature refuge, established to protect a number of vulnerable and rare plant species. Guided tours through the gorge are conducted on custom-made boats with virtually silent, electric motors. Opt for the 3hr tour which includes insights into the formation of the large, sandstone walls, a walk to the grave of pioneer John Corbett and a guided bushwalk to the top of the escarpment. The Terry family, owners of the property since the 1960s, have grown Cobbold Gorge Tours to include comfortable accommodation, a licensed bar and restaurant. Camping is also available. Gilberton Outback Retreat might be the new kid on the block, but their surrounds are about as ancient as it gets. Nearby, Gilberton Station is currently occupied by the French family’s seventh generation, so they know a thing or two about the property. This exclusive retreat is a luxurious take on the old Australian tin shed and boasts panoramic views of the Gilbert River from the balcony of this very private escape. You won’t find a TV, internet or phone here, but you will find a true connection with the environment. It’s best experienced on a guided bush walk or a 4WD Safari with the French family who run the station. Gilberton has a rich Aboriginal history and tours to rock art sites on the property showcase the fascinating layers of culture and heritage formed over thousands of years. It wouldn’t be the Etheridge Shire without a fossicking trip to the nearby goldfields. These were once home to 3000 people during the gold rush of the late 1800s and may have you stumbling across a little treasure of your own. Back on the Gulf Development Road, head east to Mount Garnet, your final outback location before the fertile, farming plains of the Atherton Tablelands. On the way, you’ll pass through Mount Surprise, a quaint country town and a great place to refuel and grab a bite to eat. Set within an overflowing landscape of gem-filled creeks and rivers, Mount Surprise and nearby fossicking hubs like O’Brien’s Creek are perfect places to pitch a tent. Pan for gemstones while enjoying shady creek-side campsites. If you’re passing through Mount Surprise on a Thursday or Friday, you might be lucky enough to meet the Savannahlander – another great rail journey traversing the Atherton Tablelands from Cairns. Just east of Mount Surprise you’ll stumble upon a field of volcanoes. Around Undara Volcanic National Park you’ll find 164 volcanoes encrusted into the harsh Australian outback. The Undara volcano (which means “long-way” in the language of the Ewamian Aboriginal people), erupted so fiercely some 190,000yrs ago that it spewed molten lava for an incredible 16kms. The Undara Lava Tubes can be explored with experienced Savannah Guides at the Undara Experience, owned by the Collins family for three generations. They’ll walk you through the tube formation, the native wildlife and stories of life on the Rosella Plains Station. Once you’ve explored the lava tubes, head back to the Undara Experience and relax in the variety of unique accommodation options; from air-conditioned Pioneer Huts and beautifully restored historic train carriages, to self-catered campsites or teepee style tents in the Swag Tent Village. After driving thousands of kms through rugged Australian outback, the Atherton Tablelands is a welcome change in scenery. The fresh smell of lush rainforest fills your lungs as you drive into Australia’s highest town, Ravenshoe (pronounced ravens-hoe not raven-shoe). Home to Millstream Falls, the first waterfall on a series of never-ending waterfall circuits, and the remarkable Tully Gorge, Ravenshoe might be small in stature but it punches pretty high in the World Heritage stakes. Once famous as a logging hub, the range and blend of forest types in the area supports the greatest variety of possum anywhere in the world. The best place to get an injection of the diverse wildlife and history is at the Ravenshoe Visitor Information Centre. Here you’ll also get a good insight of things to see and do on the Atherton Tablelands. Spend a couple of days discovering highlights on the Tablelands like the show-stopping cave systems at Chillagoe-Mungana National Park. Meander to the tropical farm-gates peppered throughout the rolling hills, growing delicious produce like pawpaw, limes, mangoes, bananas or macadamia. The high altitudes of the Tablelands is a coffee lovers paradise with locally grown and roasted beans to be enjoyed at places like Skybury Coffee Plantation or Coffee Works. Amongst pockets of tropical rainforest on this volcanic plateau, you’ll also find an endless supply of waterfall trails. To swim in the crater of a volcano, check out Lake Barrine and Lake Eacham, both perfect spots to cool off and reconnect with nature. The BIG4 Atherton Woodlands Tourist Park welcomes visitors in a range of comfortable accommodation options or campgrounds. Its central location in the Atherton township makes it an easy base to explore and restock. Your journey along the Savannah Way might have come to an end but that doesn’t mean the fun stops. Tropical North Queensland is the gateway to the Great Barrier Reef and Cairns is the launch-pad to hundreds of ways to experience it. 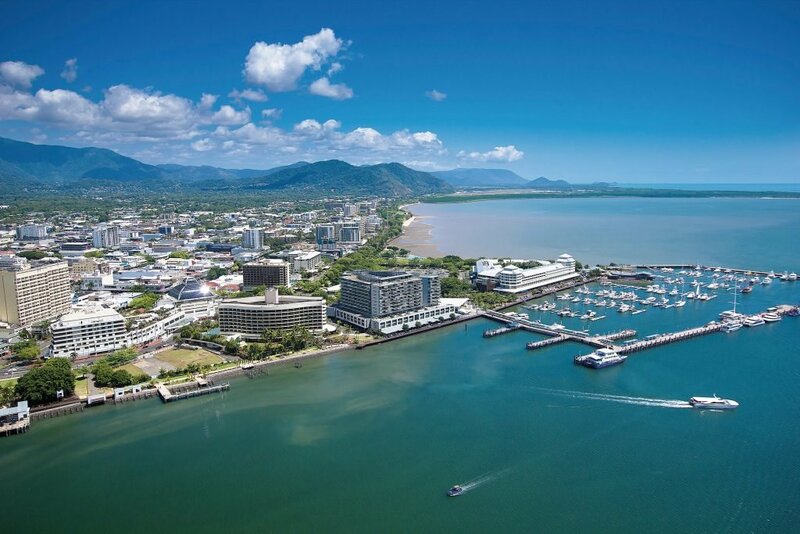 There are plenty of caravan parks between Cairns and Palm Cove or book into any of the great hotels in the Cairns CBD. Day tours to the reef or Green or Fitzroy Islands depart within walking distance from most major hotels. If you’re staying over the weekend, make a beeline to Rusty’s Market, where regional fresh produce can be picked up by the boxload. There’s also an exceptional number of restaurants and cafes to choose from, many with Esplanade or water-front locations. Explore a land of geological wonders.